Bidding for the RadioShack brand and customer data has ended, but not before Apple weighed in on the proceedings, saying that information collected during the sale of its own products should be left out of the deal. 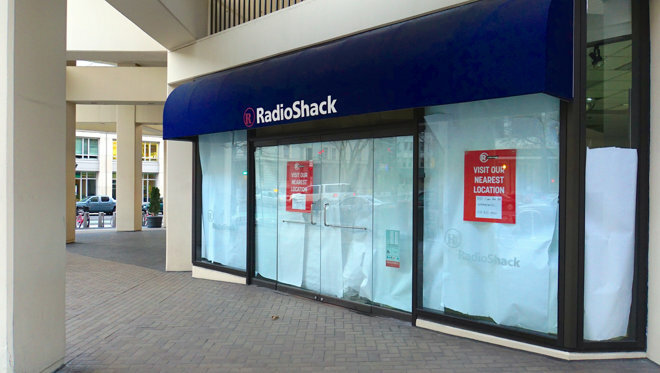 A shuttered RadioShack store, via Ted Eytan. The hedge fund Standard General was the top bidder with $26.2 million for RadioShack's brand name and customer data. The same firm bought out Radio Shack's 1,700 store leases in March, as noted by Bloomberg. But as the bidding process was underway in a Delaware bankruptcy court, Apple joined the proceedings with a filing of its own. Specifically, the iPhone maker argued that its agreements with RadioShack prevent customer data obtained from those buying Apple products from being resold. In order to gain an Apple reseller agreement, RadioShack allegedly waived any rights to the data of customers who bought Apple products, as detailed by Law360. "In order to protect its customers' personal information, Apple oversees the collection and use of customer information collected by its retail partners, including RadioShack," Apple's filing with the court reads. "The reseller agreement between Apple and RadioShack protects information collected by RadioShack regarding purchasers of Apple products and prohibits the proposed sale of such information." Also joining was AT&T, who said that RadioShack "seemingly intends" to sell information obtained during the sale of AT&T devices. The judge overseeing the case must still approve Standard General's bid for RadioShack, as well as the exchange of accompanying customer data, including some 67 million physical addresses and 8.5 million email addresses. A hearing has been set for May 20. U.S. Bankruptcy Judge Brendan L. Shannon did say last month that he would not approve the sale of any customer data he finds to be impermissible. The demise of RadioShack brings to an end a store that once catered to technology enthusiasts and hobbyists with hard-to-find gadgets, components and accessories. But as the retail space changed, and enthusiasts increasingly went online to buy products at inexpensive prices, RadioShack attempted to adapt and become primarily a smartphone reseller. That plan failed, however, leaving RadioShack with two straight years of losses and headed to bankruptcy court. Trading of the Texas-based company's stock was suspended on the New York Stock Exchange in February.